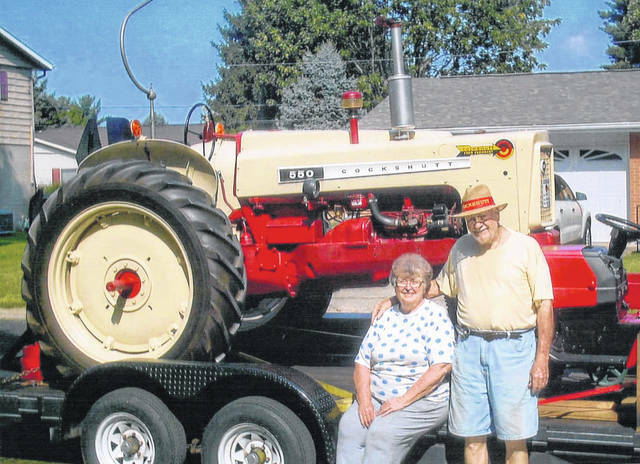 Miles and Kay Barrere celebrated their 60th wedding anniversary with their 1958 Cockshutt tractor. Miles and Kay Barrere, who were married on Aug. 10, 1958, celebrated their 60th wedding anniversary with their 1958 Cockshutt restored farm tractor nearby. Let us explain. The Barreres are members of the International Cockshutt Club, Inc. (ICCI) and have enjoyed showing and parading their tractors for 20 years. The Barreres’ tractors are from the 500 series that Cockshutt introduced in 1958 — which are the featured tractors by the ICCI for 2018. The Barreres spent their anniversary with their Cockshutt friends and about 60 Cockshutt tractors at the summer show of the Buckeye Cockshutt Club held at the Marion County Fairgrounds in Marion, Ohio. Miles and Kay were married in the Methodist Church in Blanchester, and now live in Wilmington. Their son, Dr. David Barrere, lives in Cincinnati, and their daughter, Beth Edward, resides in Harrison, Ohio.